We will hopefully be back at school around 5pm. We are currently in Shrewsbury but traffic is heavy. Everybody is having a great time in Cardiff! We have had fun at the bowling alley and the arcades. We have been for a walk and now we are off to bed! Will update you again tomorrow. Seren Yr Wythnos and Welsh Speaker of the Week Winners Treat! 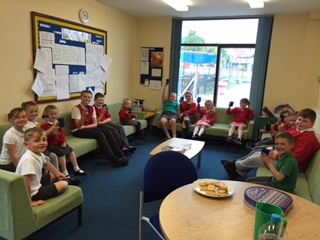 Last week’s winners of Seren Yr Wythnos and Welsh Speaker of the Week were invited to the staff room for a drink and biscuit to celebrate! Da Iawn pawb! Photo to follow. 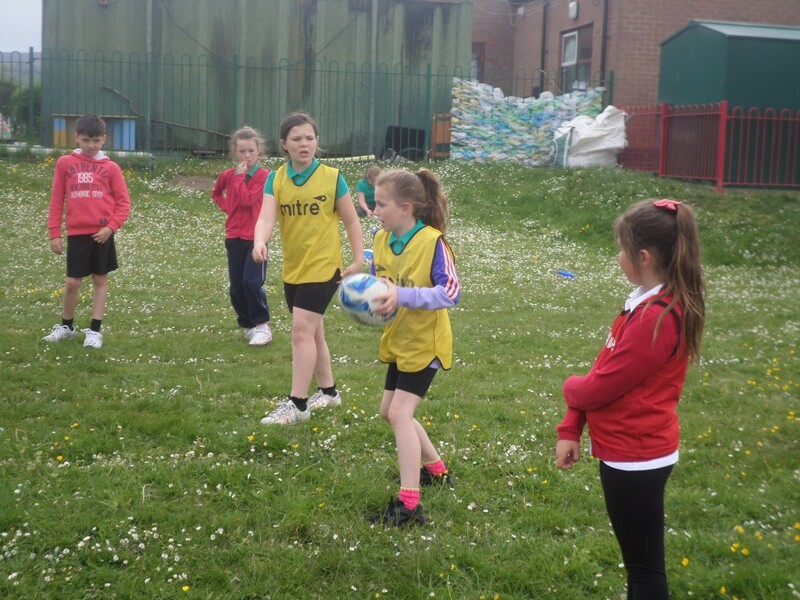 Not only did we do really well at the Rock today, but Year 5 rugby players helped coach Year 4 yesterday too! Da iawn pawb! 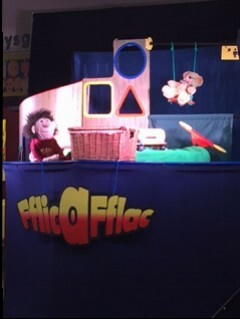 Nursery, Reception, Year 1 & Year 2 enjoyed the Fflic a Fflic show this afternoon! 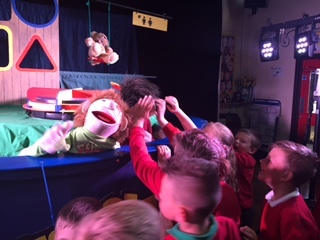 They knew lots of the Welsh phrases and songs in the show. It was really funny! 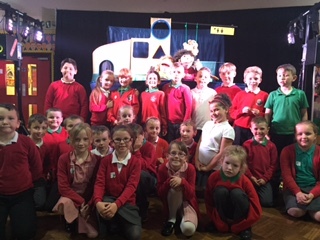 We also had a class photo with Fflic a Fflac. 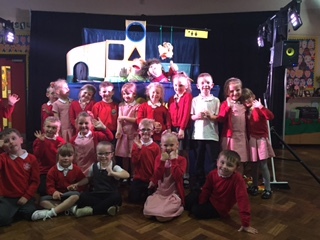 Thank you to parents for contributing £2 towards the cost of the show. Foundation Phase had an Easter bonnet parade this afternoon. 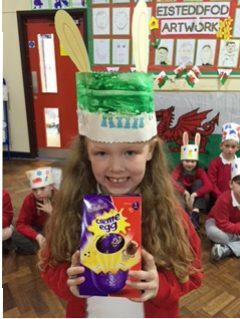 The winning bonnets were: Phoebe Owens (Reception) Fredie Hughes (Year 1) Holly Morrison (Year 2) The Junior ‘Design an Easter Egg’ winners were: Riley Pemberton (year 3) Brie Roberts (year 4) Nia Cooper (year 5) Chelsea Langa (Year 5/6) Anniah Roberts (year 6) Da Iawn pawb! The children have been very well behaved and have all enjoyed themselves. They have archery and canoeing this morning, and will be leaving after lunch. They will arrive back at school at approximately 2:30pm. You are welcome to collect your child at this time. 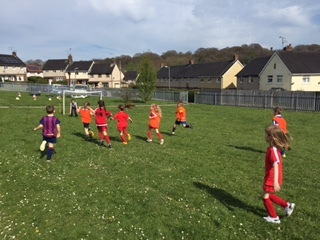 Glanllyn Update: The children are all having a good time. They have been on the climbing wall, swimming had the falconry display, bingo and have been to the disco. Hope they sleep tonight! 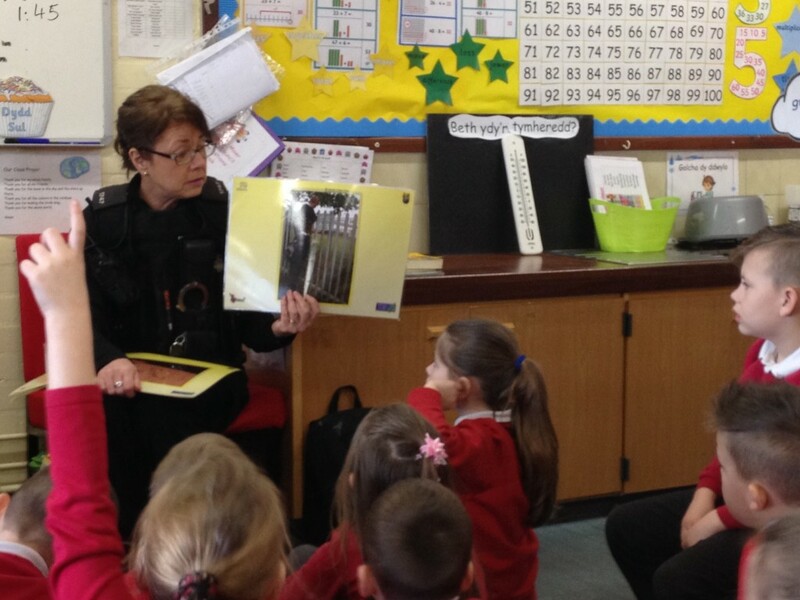 PC Kim Jones visited Year 2 today. She showed us some photos and we talked about the right thing and wrong thing to do in different situations. PC Kim said we were excellent listeners! 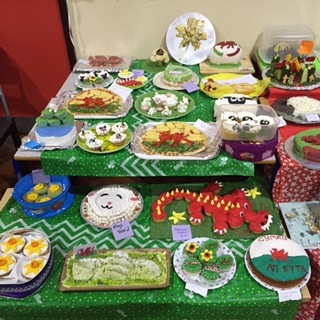 Da iawn Blwyddyn Dau!